Your Dream Home is Just a Renovation Away! Get the money you need for the purchase of a new home (along with the cash to pay for the cost of a remodel or repairs) or remodel your current home to add more value. 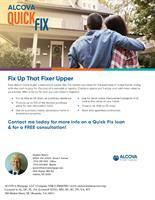 With a Quick Fix loan you can make it happen! You won’t need to get a second mortgage or use high-interest financing to accomplish your vision!